I've been in a bit of slump lately. Actually, that's not quite true. I've been so busy that I haven't really had time to sew and the last few garments that I have sewn were wadders. Most likely because I had to "hit & miss" sew - sewing one seam one night, putting in a zipper 15 minutes before I have to be somewhere, not thinking when it comes to fabric and pattern design and such. As my obligations have finally started to slow down a little and I've found a bit more time to sew, I decided that I should start back with a tried and true pattern. I know many of you have tried 'n' true patterns (TNT's) and lately, what with the Everyday Wardrobe and all, I've really been trying to reach for those patterns that I know will work for me and my shape. The skirt from the Lonsdale dress (now the Hollyburn pattern) is one of these for me. I LOVE this skirt. This is the 5th time I've made it and it did not disappoint. For someone who walked into their sewing room only last week and thought "ugh..." this was a great pick-me-up sewing project. It's true, I need another skirt like a hole in my head, but sometimes you've got to feed the urge, ya know. 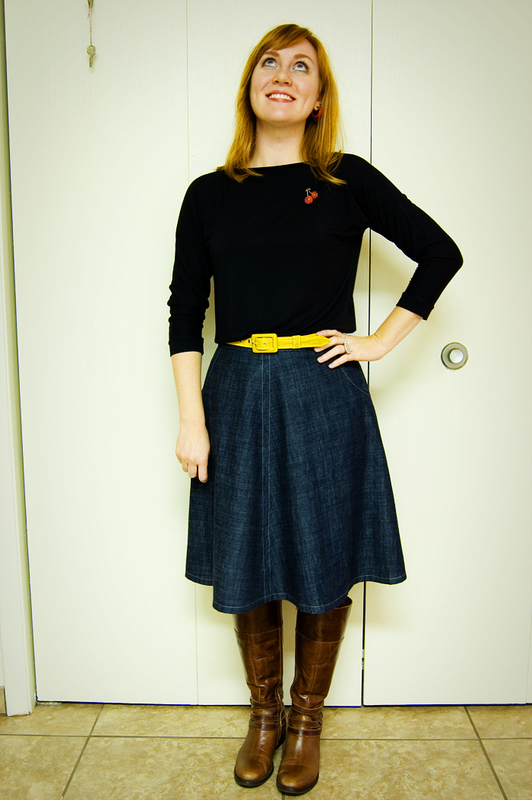 For this make, I picked a lightweight denim (something I picked up from Joann about a year ago) and I lined it in bemberg rayon (from Yellow Bird). The inner waistband and pocket lining was done in leftover Liberty of London cotton lawn (from a blouse I made awhile back and have been meaning to show you). I love using up every last bit of fabric like that! I topstitched the denim in a sliver/gray silk thread - I'm totally in love with this idea too because the topstitching isn't overwhelming. Sometimes that denim topstitching thread is just too much, so for a lighter option try some of that Gutermann silk thread which can be found at Joann. Even upholstery thread would do the trick. Do you guys have any tried 'n' true patterns? What are they? I love the idea of these types of patterns. I love the idea of making several different looks from the same pattern by incorporating different elements too, like gathers, pleats or other design options. In other news, I made the top I'm wearing too. It's a modal knit that is just about heaven against my skin. Gosh it's so comfy. I'm going to be teaching some middle schoolers to sew - yes, the same as last year, except this year I only do it one day a week for 2 hours. And I've heard the kids are wayyyy awesome this year. I'm actually really excited about it and its definitely something that is much more manageable for me. So, I had to come up with some easy projects for them to do. This knit top was one of them. I don't know if you would believe it, but this is a box blouse with kimono sleeves and its seriously so easy to make and sooooo easy to draft. I think its such a tres chic style and I can't even tell you how in love with it I am. Truly! I'm going to tweak the fit a little bit and make only about a million more. Cute skirt! I enjoyed reading how you finished the hem for it. Glad you're feeling better. Love this skirt! My TNTs range from a two-seam elastic-waist pant from the 1970s to a 2011 McCall's princess-seamed blouse to the Folkwear Walking Skirt. Lovely! What a great fall skirt. The grey top stitching does add sophistication. I'm definitely going to keep that in mind if I ever work with denim! Hey! I love your outfit too, you look great! My TNT pattern is Simplicity 2147, or as some people like to call it - the potato sack... I've made it six times, three times as a short-sleeved dress, once as a sleeveless dress and twice as a blouse. I'm particularly pleased with the sleeveless party version and the colour block dress. I wish I had more TNT patterns though, as a backup, when I'm in doubt of where to go with my sewing. BTW, good luck with the middle schoolers! Hope it will be easier for you this time around. I LOVE IT! I've yet to find any TNT patterns :( :( But, I hear amazing things about Sewaholic so I think it's about darn time I give them a try! I really love your outfit! Simply but classy! Please, please, I want a tutorail on the shirt too!!! I really love it. THIS is the kind of skirt/outfit I can wear everyday as a stay at home mom. It looks really comfortable and stylish. How cute is this?! I love the topstitching detail-- it's a nice change from the usual gold. Really, really sweet! I also love the knit top-- I want one now! very cute skirt by the way, denim is always a winner and a skirt like that is so versatile. Thanks for Sharing! 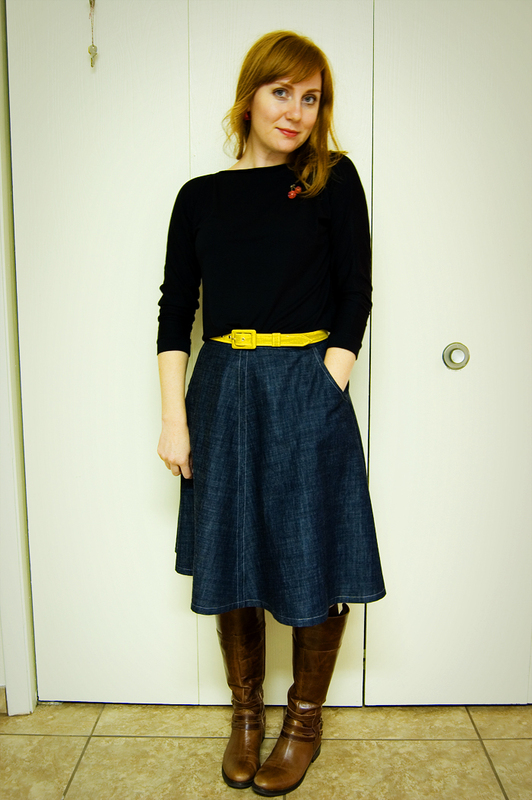 Great skirt, Sunni, and the denim dress is fab! You've inspired me - I was planning on making a shirt dress, now it may be denim, too. And I'm definitely going to try some flannel lining! Thanks for the tip. Adorable!! My tnt are circle skirts (so many to the point that I don't actually need any anymore ha), the colette sorbetto top, and the lisette traveler's dress. For my daughter it's a peasant dress top with various skirts attached, a fleece jacket with variations (hoods, pockets, hopefully a full lining the next time I make one), the oliver + s bucket hat, and I really want to make another oliver + s family reunion dress since the first one I made was pretty much the best thing I've sewn for her (albeit quite time consuming). I admit, with no qualms at all, that I wear that denim shirtdress to DEATH! I love that thing and it just keeps on ticking! I can wear it to so many things and I just feel like a million bucks - everyone needs one of those! I solemnly promise to do a tutorial for how to draft and make one. THE easiest thing in the whole world to make! Its a fabulous top! I love Sewaholic patterns! I'm loving them more and more all the time too because I feel that Tasia has a real feel for "everyday" wearable clothing. Her designs and patterns always come to mind when I'm needing to fill in gaps in my wardrobe. Great patterns! I'll totally do a tutorial for the shirt. Seriously, I need a million more and they are sooooooooooooo easy! Yay! Thank you! I had the same feeling about it. Tutorial coming right up! Yup TNT's way to go for a hassle free sewing experience, and with a few tweaks and by using a different fabric they often don't even look like the same pattern. love your combo, you do smart casual so well. Love the skirt. Chin up etc. Sometimes you just need to do something else for a while (and since you're well and truly ticking that box... XD). Really like the look of the top, and from a mooch about, I think your blig's going to be a great go-to to add to my sewing knowledge. Hope you get a chance to the add the knit top tutorial soon.